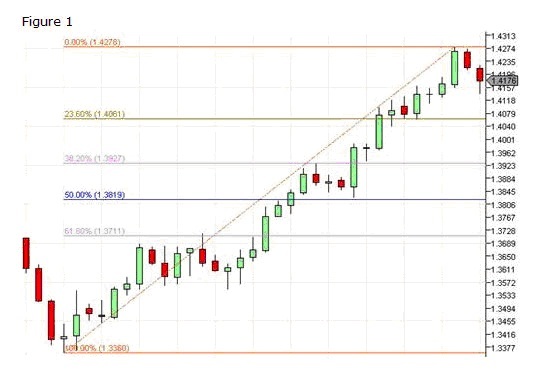 The Fibonacci Retracement is probably the most heavily used Fibonacci tool in the toolset. 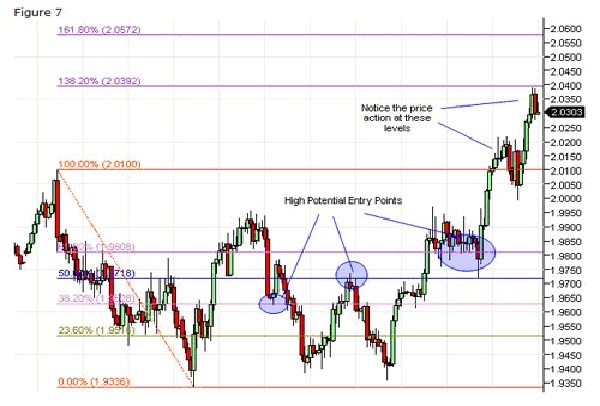 You will find Fibonacci Retracements as a solid tool in identifying key support and resistance areas. If prices have fallen from a recent swing high down to a swing low, the expectation is that price should retrace distance, high to low, by a ratio of the Fibonacci sequence. You can use Fibonacci retracements and extension from a tick chart through a daily, monthly and weekly. Literally any time frame. It is important to note, the larger price move from swing high to swing low, the more accurate the retracement projections. Identification and selection of the correct swing points are keys to success. While there are many variations of the ratio set, simple is better, lets focus on four major retracement levels. â€¢	23.6% — The shallowest of the retracements. In very strong trending markets price typically quickly bounces in the area of this ratio. â€¢	38.2% — This is the first line of defense of the current trend. Breaking this level starts to erode the underlying trend. â€¢	50% — The neutral point of any retracement. This is the critical tipping point. â€¢	61.8% — retracing to this typically signals a breakdown in the trend. Notice in each case we have simply added 100% to the standard ratio set. I use this set of retracements on a daily basis, from 23.6% all the way to 200% and sometimes 300% For my style of trading I find 38.2%, 50% and 61.8% quite reliable.I use the other primarily as confirmation levels. 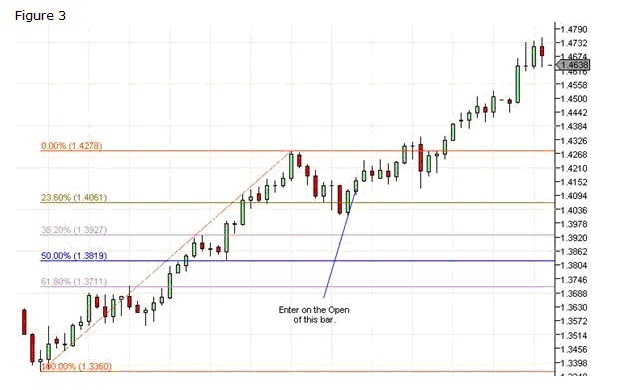 So lets take a look at some examples of Fibonacci Retracements in use. Take the example below. The EUR/USD had risen from 1.3360 to 1.4278. The next day the EURUSD failed to make a new high and the potential swing point was in place. So I using swing points I placed a Fibonacci retracement on my chart. The trend was obviously very strong and the first retracement to the 23.6% level was met with a violent change in direction. You can see the dip below the 23.6% level and the sudden reversal. While there are multiple entry methods, the most conservative would be to wait until the level is penetrated and price establishes itself above that level and enter on the open of the next bar as shown. With the right money management, you can see in this example this could have been a serious winner. Once you understand the method you can find countless examples. Every market, FOREX, Equities and Futures each exhibit these patterns to some degree. Lets look at another example using the USDCAD. You can see in this example there are multiple entry points for both trend and countertrend trades. Lets zoom in and look at the area highlighted in blue. 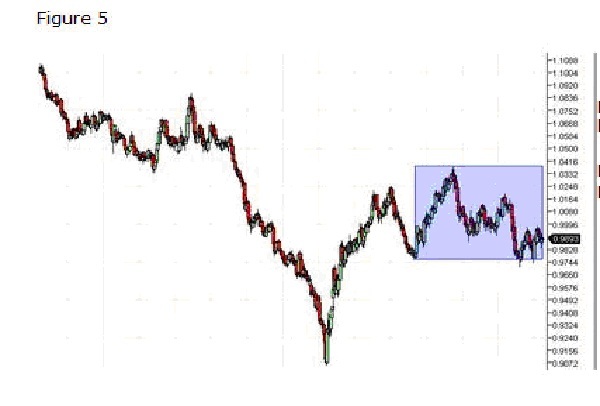 Fibonacci Ratios work on virtually any size price swing. 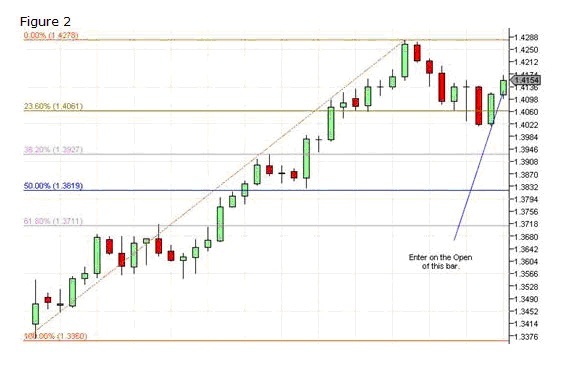 The chart below shows the Fibonacci Retracement applied to the smaller price swing. The blue ellipses show the high potential entry points. Notice, in each of these cases you could have entered the market with a relatively tight stop loss with high reward potential. Ok, we have shown some examples of well behaved price action. What happens if price retraces 100%? How far can it go beyond this point? Fibonacci ratios provide some clues to answering this question and finding low risk entry points. The example below shows the GBPUSD making a bottom and bouncing back. And multiple entry points from the same set Fibonacci Retracement levels. Of note are the high potential entry points at 38.2%, 50% and 61.8%. Each of these could have been entry points with solid profit potential. However, notice after the initial breakout above 100%, there were other opportunities to get in the trade. Ultimately price jumped to the 138% point before backtracking. This example shows yet another way to use Fibonacci Retracements. This example shows why it is valuable to identify potential levels above and beyond the initial 100% retracement. 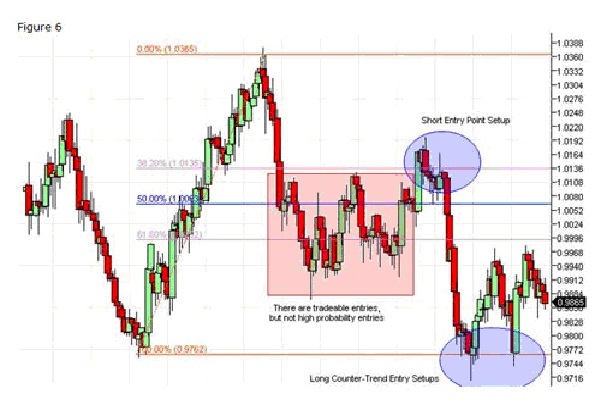 Retracements are the cornerstone of Fibonacci theory as it applies to the financial markets. 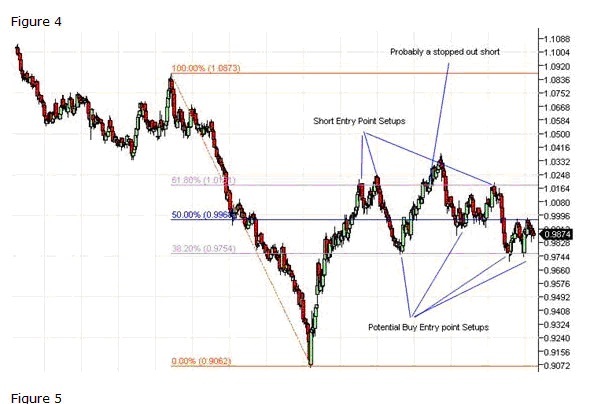 Hopefully these examples have provided guidance from which to draw your own retracements and expand your trading toolset. You can never tell when price action it going well beyond the 100% level. This entry was posted in Uncategorized by adminblog. Bookmark the permalink. Superb posting. Continue to keep up the very wonderful performance.